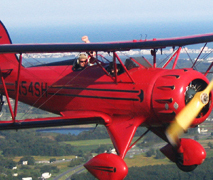 Ocean City offers both scenic plane rides as well as transportation services. Take a ride overtop OCMD and get a birds eye view of our amusement parks, hotels, and beautiful beaches. Arial tours leave from the Ocean City Airport. MAny out of state visitors utilize the Ocean City airport with private planes and limited commercial services. The Salisbury Airport offers flights connecting world wide. Take advantage of this no stress airport when visiting or traveling outside Ocean City Maryland. ☞ The Salisbury-Ocean City: Wicomico Regional Airport (SBY) is the only Federal Aviation Administration certificated air carrier airport on the entire Delmarva (Delaware-Maryland-Virginia) Peninsula. With daily scheduled air carrier service provided by US Airways, the SBY Airport can fly you to anywhere in the world. ☞ Enjoy seeing the beaches of Ocean City and Assateague in our two passenger bi-planes or our three passenger Cessna. The thrill of flying returns with leather helmets and an open air adventure. Relive the 1930's with the roar of radial engines and the wind in your face from the most experienced pilots in the Delmarva area!